Sergeant Nicole Wilson began her career in animal welfare in 1998 working in the Community Outreach and Humane Education Department of the Humane Society of Washington County in Hagerstown, Maryland. While there, Nicole established a behavior hotline to provide a resource for pet parents. In 2001, she moved to the Women’s Humane Society where she was a Humane Educator. On just her second day, George Bengal recruited her to assist on a cruelty call, marking the moment when her transition to law enforcement would begin. In 2003 she became a Humane Society Police Officer and in 2006, Nicole moved to the Delaware County SPCA where she was recruited to run shelter operations, develop a behavior program and establish cat-friendly holding policies. 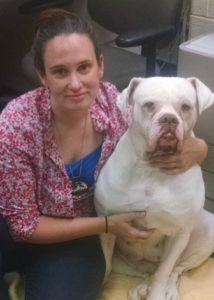 In August of 2009, she joined the PSPCA’s Humane Law Enforcement team as a Case Manager before moving into a Supervisor role.